The first thing you’ll notice is that the coupon sets a value, and focuses on that value. 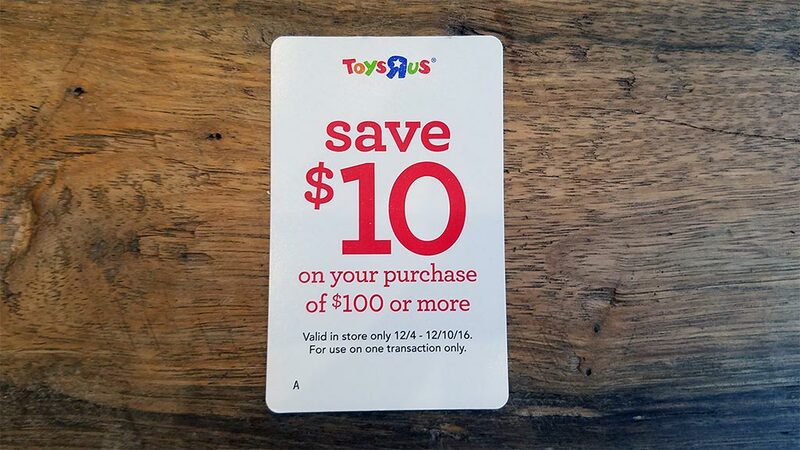 By making the $10 the largest part of the coupon, the customer immediately has their eyes drawn to it, imbuing it with a psychological value of $10 – which is a meaningful number for a Toys R Us customer. The other thing that’s important to note is that the coupon itself is the same size and shape as a credit card (and now, most gift cards), and was easily removed from the flyer it was attached to that came in the mail. Not only does this make the coupon portable, but it gives it additional perceived value in that you can hold it and actually “use it” as a payment method. The simple physical existence of the coupon can strengthen the perceived value in that it physically exists – just like a real gift card or credit card, instead of just being a code you tell the cashier. Taking my son’s immediate reaction to seeing the coupon, you can see this approach works. As I said, before I showed him the fine(r) print and explained you needed to spend $100 or more to use the coupon, he’d already placed a $10 value in his head on the coupon. And along with just the value, it also leads to a state of excitement – in particular that the customer now is holding something of value ($10) and that to not spend it would be to throw money away (a kind of variant of the sunk cost fallacy). Now I don’t have access to Toys R Us’s financials, but I can make a very strong guess that the average order value for an in-store purchase at Toys R Us is under $100. So why the $100 threshold? To encourage customers to spend more than they normally would. I’ve seen many times in my own experience that when you put a meaningful number behind a coupon that you can drive a higher average order value by doing so (particularly when it’s a set $ amount vs. a percentage off). The trick is to keep the total purchase price within a reasonable range, but still considerably higher than what you would expect a customer to normally spend. This can be especially important during specific times when people might be more inclined to be making multiple purchases of similar products. For example, during the Christmas season toys are obviously a very popular product. But people also are pretty financially conscious during this time as they are likely buying in much larger quantities (for more kids, multiple gifts per kid, etc). So not only can you drive that average cart size up, you can do so by taking market share from your competitors. When you’re encouraging a customer to come buy more than just one or two items by setting a higher minimum order requirement you are also encouraging them to start looking at your store for other items on the list, so they can meet that minimum order size. As you’re determining any kind of coupon strategy, it’s important to try to consider just what it is you want to accomplish with a coupon. In Toys R Us’s case, they’re trying to drive in-store traffic, and they’re hoping to have customers feel that this “item” they received in the mail is actually worth something (and would be stupid to throw away). They’re also hoping to get more share of wallet from customers by encouraging a larger purchase than they might normally be expected to make. The point is, there’s a lot you can do with your coupon strategy to affect customers, or even specific sets of customers, in specific ways. Make sure you know what your larger underlying goal is when you put together a coupon. You can do much more to affect your bottom line by thinking your strategy through vs. just putting out a 20% off any order coupon (although those do have their place). Here’s a Bonus Tip: One thing that I’ve seen work very well when doing coupons is to make them appear to be specific to a customer. When you personalize the code to a specific individual, that person often feels the coupon has even more value, as it’s something special just for them and not available to everyone else. Do you have any coupon tips? Anything cool you’ve done using coupons to affect customer behavior? Share it below.